So I just sort of have a hunch that this thing called the internet is going to be around for a while. Since it's going to be around for a while, I think it's important that we have some understanding of how it works. 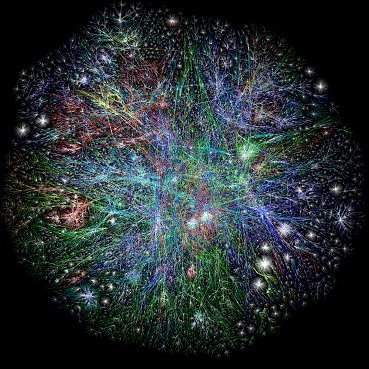 This internet is a network of networks. simple. Imagine your brother hooks up his computer to his friends computer and they share stuff, and the call their network "Cool stuff". Now imagine you hook up your computer to your friends computer and you share stuff. You call this network "Cooler stuff". Those are two networks: "Cool stuff" and "Cooler stuff". Now imagine one day you decide to hook up your brothers network, "Cool stuff", with your network, "Cooler stuff". Now you have a network of networks, or an internetwork. That is what happened with a few Universities on the West Coast of the US in the late 1960s. They hooked up networks to networks and created.... THE INTERNET (well, sort of, they called it ARPANET and it was a simple version, it didn't have lolcats). 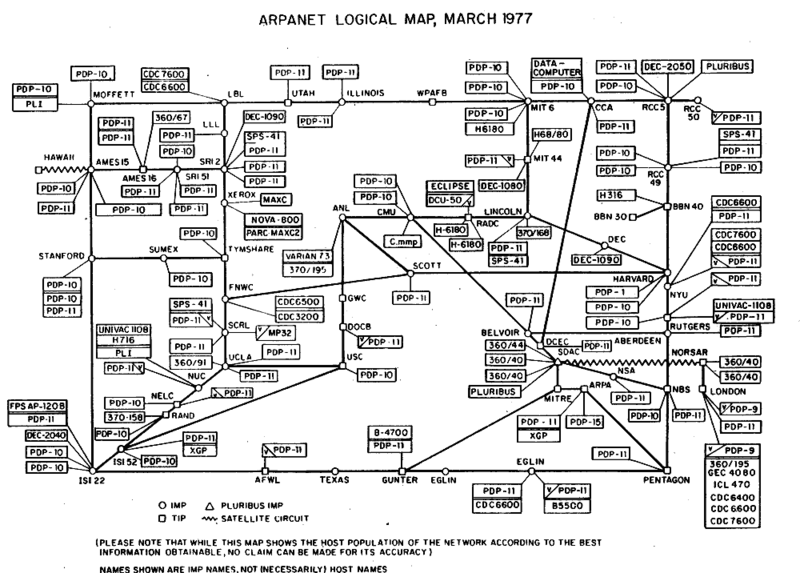 Here is an image of the logical structure of the ARPANET in 1977, notice some of the places (STANDFORD, NYU, XEROX, HARVARD, the PENTAGON). Now the ineternet is still just a bunch of networks connected to a bunch of networks. The place where they connect are called INTERNET EXCHANGE POINTS (usually abbreviated to IX). When you go onto the internet and you view a website for your favourite soccer team in Italy, the site might take a second or two or three to load up. That is because the site is being sent from where it's stored to an internet exchange point in Europe (probably in Amsterdam, Frankfurt or London) then it's sent to an exchange point on the West Coast of England, then it's sent under the Atlantic Ocean to North America then to an ecxhange point there, then to maybe a few others, then to your computer. 3) When you are done watching both videos, download the following worksheet. Open it on your computer and answer the questions.